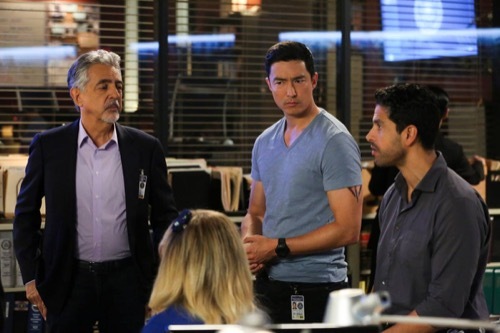 The team had believed that it was Special Agent Owen Quinn that had been turned by the cult however they soon learned how very wrong they were on tonight’s all-new episode of “Criminal Minds”. Quinn had been kidnapped and tortured, but he was never the traitor. His fingerprints hadn’t been burnt off as some sort of initiation. It had been burnt in order to plant a false flag. The cult known as the Believers had wanted the FBI to believe that Quinn was the traitor because they hadn’t wanted them to look into the real FBI Agents that had been turned. Like Agent Meadows. She had shot Owen at the first chance she got and had then turned tables on Agent Spencer Reid. Reid could either resist giving her what she wanted or she would have killed Garcia, so Reid chose to save his friend. He agreed to help Meadows and had gone with her to free both her Messiah as well as young Theo. Theo for some reason or another had been chosen to become the next Messiah to their little cult. The young man had probably suspected as much when he decided to turn against them and kill his parents however the cult still wanted him and so he had been forced to go along with them. Reid had done everything that Meadows demanded of him and he had also left behind some clues. He used sign language to identify Meadows as one of Ben’s Believers and he also kept eye contact. Reid had wanted his people to later see how he pulled the fire alarm because he knew they would figure out why he did it and he had been right. They thought about it and they could see that Reid would use the fire alarm as a nonaggressive way of clearing the building. Meadows would otherwise have had to kill people to get everyone that she wanted and so the fire alarm forced everyone to leave the building. The Director of the FBI had even thought that the institution was being targeted and so hadn’t wanted to allow anyone until the BAU had forced their way into the building. The team had had security footage and they had Quinn. Quinn was found in enough time that he was rushed to the hospital and will most likely survive though thankfully he had helped fill the team in before he was rushed into surgery. He told them about Meadows and that along with the footage had confirmed what they found. They knew that someone from the cult had conned her way into getting a job with the FBI and so they looked into why she would do that. Meadows had been at a desk job and the only time that she had stood out was when she inserted herself into the investigation. She must not have been able to help herself then and so the team looked into her career. It seems that Meadows had spent decades at the FBI hiding what the Believers were doing. She covered up their crimes and had hidden thousands of deaths. She had been so good at her job that Prentiss wondered about the first time they talked. She remembered how Meadows had lingered at the doorway and hadn’t wanted to fully come in. It hadn’t made any sense at the time and so she thought about Reid’s message. He said Ben’s Believers and she thought that meant Ben Merva when it dawned on her that there had been another Ben some years ago. Ben Cyrus had been in charge of the Liberty Ranch in Colorado. He was a cult leader and it had been the BAU that had taken him down. They had, in fact, killed Ben and so Prentiss believes that’s what Reid was trying to tell them. He was warning them that this revenge against the FBI was personal. The cult that had survived back then had only done so after their leader attempted to kill them all. He had rigged the building to explode when the cops came on the compound and so it had mostly been women and children that survived. Meadows was probably one of Cyrus’s wife. She and the other survivors had been put in the Witness Protection program and she used that as a chance to start over. She trained and she worked towards bringing down her cult’s enemies. Theo was just one of the sorry few that had been born into the cult. He had no history or even a birth certificate because Witness Protection had also shielded him, but knowing that the program had taken so many of these people had helped the team track them down. They were even looking into whoever had enough land to hide people when suddenly Garcia returned. She told them how Theo and Reid had caused a distraction that allowed her to slip out and so she directed to the warehouse they had been taken to. Only by the time the team got there, the building had been deserted and all they found was Theo’s body. He had been shot in the struggle and had died right almost instantly. The team had regretted Theo’s death only they knew that the cult was planning something and they couldn’t wait around to figure it out. Reid had told Garcia how to get out of the warehouse and he told her that it’s happening at 10:23, so the team tried to figure out what was happening before anyone else died. They looked at the cult back during its early stages and how Ben Cyrus had given himself the middle name Franklin as a way of calling himself a founding father. The cult leader had been so obsessed with the idea of rebirth that the team realized that’s what the cult was going to be doing. They were going through their own rebirth and so the team tried to figure out where. It wasn’t at the old compound because they checked and no one was there. Luckily, Garcia remembered the information she had on Ben Cyrus. He had gone to prison in Kentucky for molesting girls and that’s where he found religion. So the team knew it was Kentucky. To narrow it down even further, they remembered that three hundred was the number of angels that had guarded the Garden of Eden and while there was no Eden in Kentucky there was an Arcadia. The team went with full FBI support and they found the cult as they were about to sacrifice Reid as the last human sacrifice. He had apparently been the only one that had won over Cyrus’s respect all those years ago and so that’s why they saved his hyoid last. The hyoid bone was something the cult collected because they liked to take the voice of the protectors and they were going to do that to Reid but his people had arrived and they were able to save him as well as several members of the cult. Its doubtable whether any of these latest cult members will go back into witness protection.